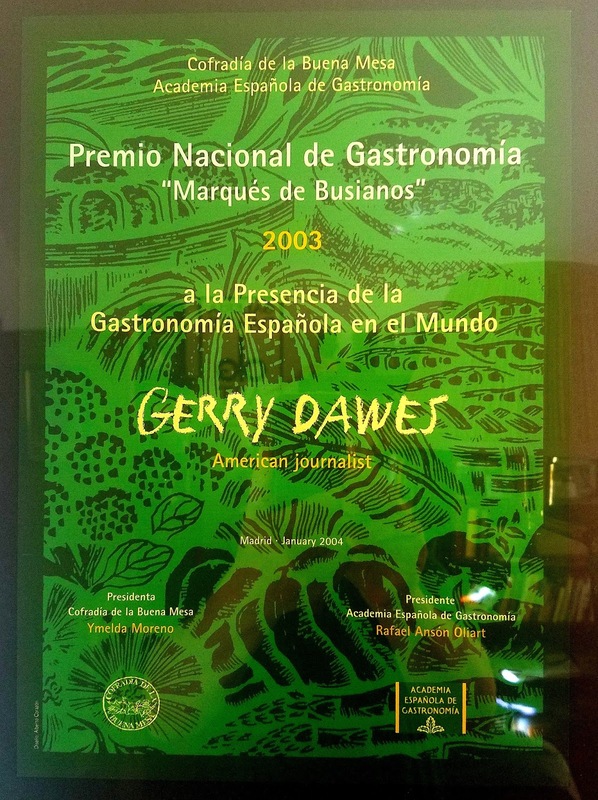 Gerry Dawes is a New York-based gastronomy, wine and travel writer-photographer who specializes in Spain. He lived in Spain for eight years, has been traveling there for thirty years and visits the country as many as eight times per year. In the past decade, he has made more than sixty extensive food and wine trips to Spain and leads gastronomic and wines tours to Spain. Gerry Dawes was awarded the prestigious Premio Nacional de Gastronomía Marqués de Busianos 2003 (Spanish National Gastronomy Prize) from the Spanish Academy of Gastronomy for writing, photography, and lectures about Spanish gastronomy and wines and is also the only non-Spaniard to receive the prestigious Premio Cena de Los 11 Vinos, an award created to honor those who have made significant lifetime contribution to enhancing the image and culture of Spanish wines. According to Food Arts magazine, Dawes is known, "for good reasons in wine and periodical circles as Mr. Spain." 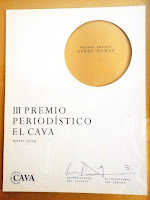 The Rosengarten Report says "Gerry Dawes--has emerged as the leading American speaker, consultant, and writer on the subject of Spanish wine. 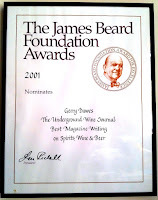 . . suffice to say that everyone from The New York Times to the James Beard Foundation, from 60 Minutes to CNN, has sought Gerry's wisdom on the subject of Spanish wine, food and culture." 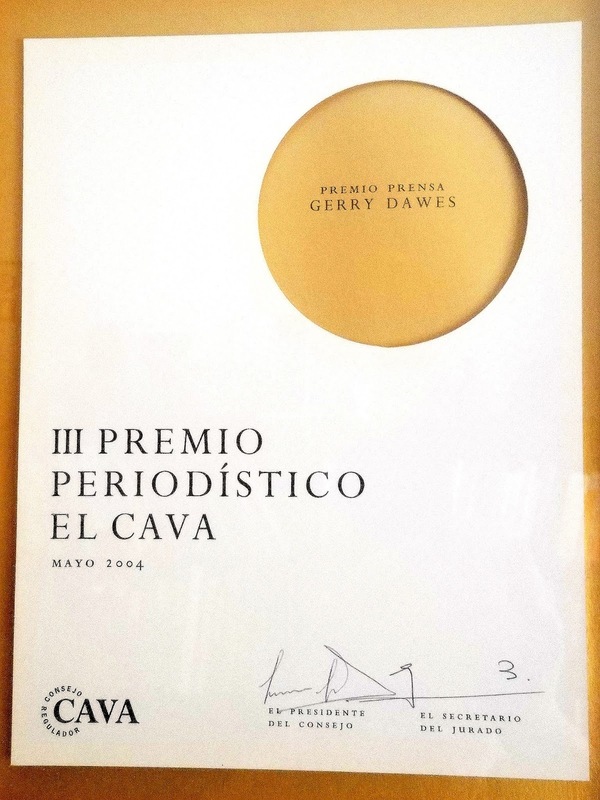 Dawes has published hundreds of articles and photographs on Spanish food and wine for numerous publications and he lectures frequently both in the U.S. and in Spain on Spanish gastronomy, wine and culture, often using colorful PowerPoint presentations illustrated with his photographs. 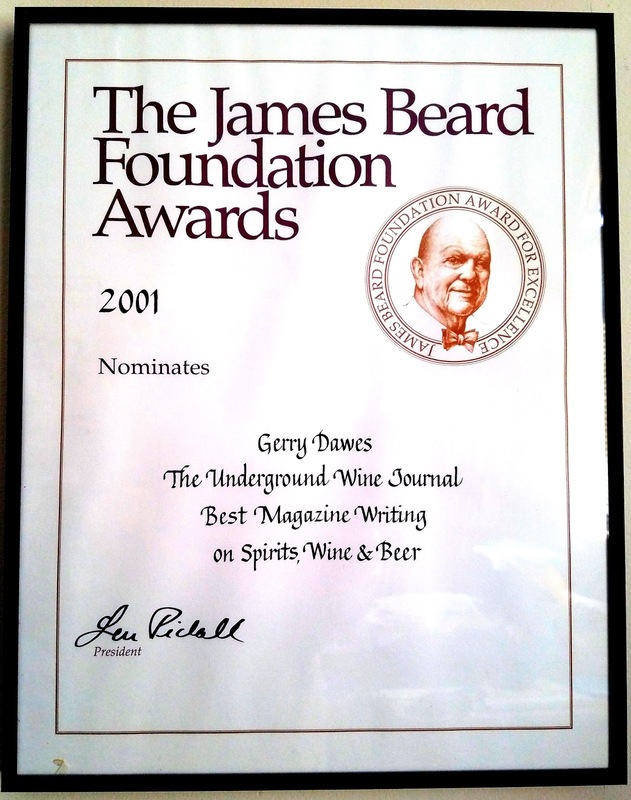 — Finalist, 2001 James Beard Foundation Journalism Awards: Magazine Writing on Spirits, Wine and Beer. Audio clips: A radio interview in English with Restaurant Guys. — The Wine Spectator (photos only). 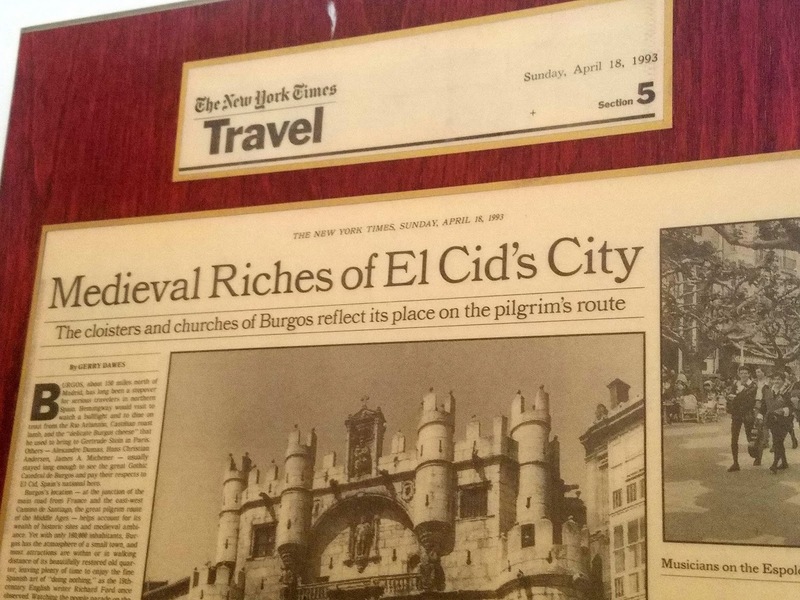 — Wine News, 3,000-word article on Ribera del Duero with photographs. (Oct. - Nov., 2006). 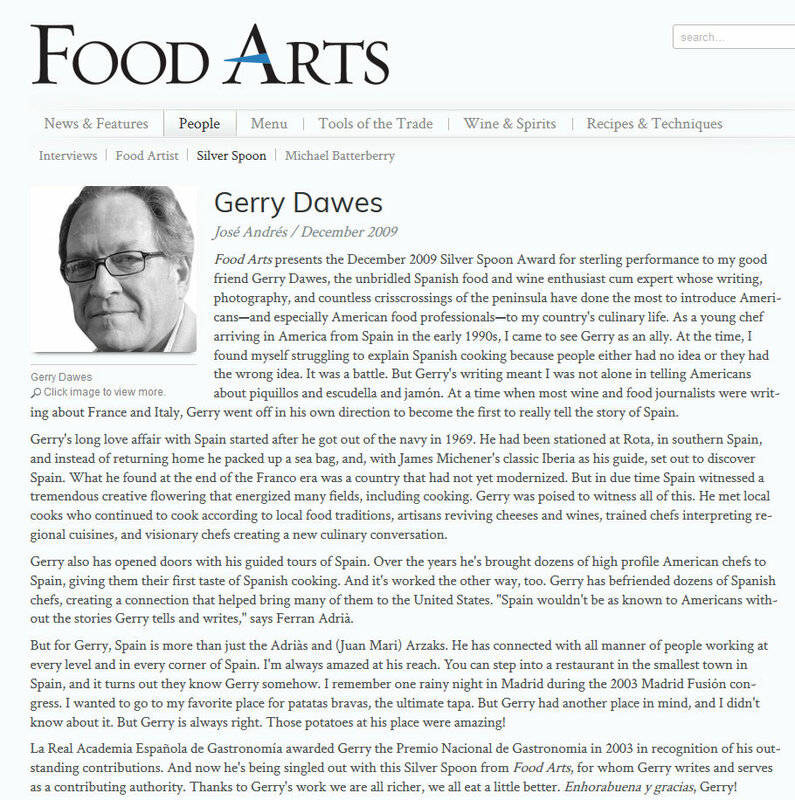 — Foods From Spain News, Gerry's View, (Autumn edition). — Spain Gourmetour, 3,000-word article with photographs on Valencian wines pending publication. — Featured Panelist on Spanish Cheeses & Wines, More than Manchego, Arbequina and Rioja: Exploring Spanish Denominacion of Origen Cheeses, Olive Oils and Wines, International Association of Culinary Professionals, 27th Annual Conference, Wyndham Anatole Hotel, Dallas, Texas (April, 2005)Demand for seminar required moving it a room with double the capacity. — Guest speaker, CRDO Ribera del Duero Special Selecion Wine Tasting Tour of the U.S. 2005, eight events in Chicago, Culinary Institute of America-Greystone (Napa Valley), Berkeley, San Francisco and Washington, DC. 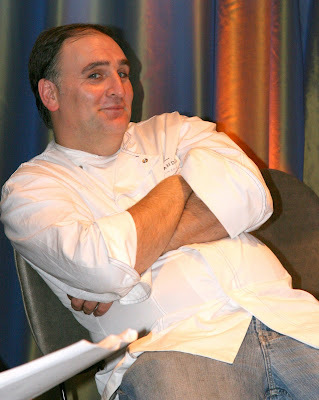 — Holland America Cruise Lines Food & Wine Magazine Enrichment Program (July, 2006): Lectured on the tourist attractions and gastronomy of Cataluña. Power Point presentation on the cheeses and wines of Cataluña, followed by a tasting of six wines and six cheeses. 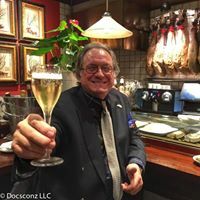 — Silver Seas Cruise Line Wine Lecture Series (Oct. 3 - 9): Lecture and tasting of Spanish Mediterranean Cheeses and Wines; Lecture on the cuisines and wines of Cadiz, Malaga, Valencia, Barcelona and the Balearic Islands. 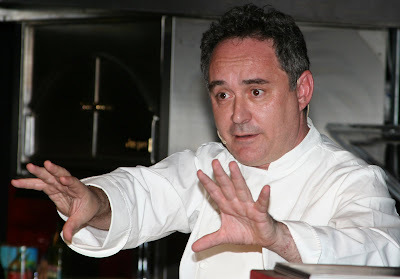 — Spains Ten Conference (New York City, Oct. 13, 14, & 15): Emcee & presenter of chefs at a day-long event featuring ten of Spain’s greatest chefs and the most important Spanish gastronomic event ever held in New York. — Commonwealth Club of San Francisco (Oct. 19-30): Led 24 members of the West Coast's most prestigious public forum society on a gastronomic and wine tour of northern Spain (Madrid, Ribera del Duero, Burgos, La Rioja, Bilbao, San Sebastian, Navarra and Barcelona). — CIA-Greystone, Napa Valley (Nov. 1-4): Five seminars with Power Point presentations on Spanish regional gastronomy, cheeses, wines, etc. at the most important Spanish gastronomy conference ever held in the United States.